November 5, 1950 saw the debut of what many observers at that time considered radio's "last gasp": "The Big Show" - "ninety minutes with the most scintillating personalities in the entertainment world." The National Broadcasting Company mounted the expensive, star-studded extravaganza in an effort to reclaim its former dominance on Sunday nights, decimated by both television's rising popularity and the success of rival CBS in peeling off much of NBC's former talent (Jack Benny, Edgar Bergen, "Amos & Andy", etc.) in the Tiffany network's legendary "talent raids." With a price tag of nearly $100,000 (that's $885,000 in 2008 dollars) per broadcast, "The Big Show" presented a weekly mixture of comedy, drama and music from such guest stars as Jimmy Durante, Ethel Merman, Danny Thomas, Groucho Marx, Fanny Brice, Bob Hope, Eddie Cantor, Rudy Vallee, Judy Garland and Fred Allen - the latter graduating to semi-regular/contributing writer status. In fact, each program found the guests introducing themselves by name; the introductions completed with a husky voice intoning "...and my name, dahlings, is Tallulah Bankhead." Bankhead, a celebrated stage veteran renowned for her work in plays like "The Little Foxes" and "The Skin of Our Teeth," served as the show's mistress of ceremonies - proving to be both an apt foil for the program's guests and a self-deprecating good sport for an endless series of "rivalry-with-Bette-Davis" jokes. In explaining her motivation for agreeing to host a weekly radio series, she told Newsweek Magazine "I have to live in the style, dahling, to which I'm really accustomed." The "glamorous, unpredictable" Talloo also added two memorable trademarks to the "Big Show" proceedings: announcing the network's half-hour I.D. as an opportunity to "ring my chimes" and leading the show's guest roster in a rendition of "May the Good Lord Bless and Keep You" at each program's close. 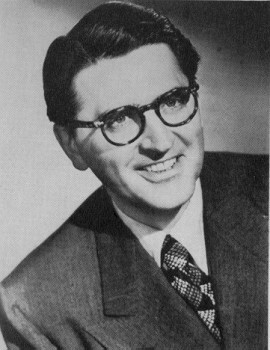 During its original radio run, "The Big Show" received glowing reviews in the press; author Jim Cox quotes one critic as calling it "a perfectly wonderful show - witty, tuneful, surprisingly sophisticated and brilliantly put together...one of the fastest and funniest ninety minutes in memory." But back then - as it is now - the public had the final say, and even though NBC scheduled the program in a time slot so as not to interfere with the television audience (estimated at about 8,000,000 viewers) it was difficult for "The Big Show" to make a dent in the ratings, being regularly trounced by CBS' "The Jack Benny Program." 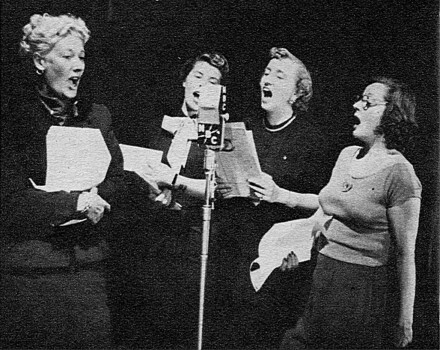 In the fall of 1951, the program valiantly attempted to goose its numbers with a lavish publicity stunt that found the cast jetting off to Europe to do broadcasts from London and Paris. (The ink-stained wretches of the European press, however, weren't nearly as complimentary as their American counterparts.) Struggling with a monstrously expensive budget and a lack of sponsors to compensate for same, "The Big Show" limped through its second and final season, finally throwing in the towel on April 20, 1952. It was estimated that NBC ultimately lost nearly a million dollars on its ill-fated venture. "The Big Show" has long been considered one of radio's biggest financial failures but, listening to the program through 21st Century ears, the show will surprise many a radio fan; the program's writing remains top-notch, the performers are at the peak of their craft, and the music remains sprightly and entertaining as ever. What makes "The Big Show" mind-boggling is that it seems inconceivable that a program of its scope could be put across today. 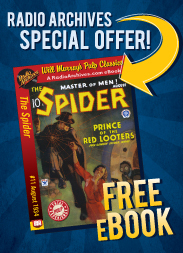 Of course, many thought it impossible back then, but host Tallulah Bankhead reassured listeners that "all it takes is courage, vision...and a king-sized bundle of dough." And with that, Radio Archives invites you to listen to a courageous, visionary - and yes, expensive - program from radio's Golden Age; the first five shows of the series that, thanks to expert transfers and complete audio restoration, make a battered-and-bruised contender sound like a genuine champ. The highlights of this inaugural program include a medley of songs from the then-current Broadway musical "Call Me Madam," a tribute to George M. Cohan, a recitation by actor Jose Ferrer from his motion picture hit "Cyrano de Bergerac," and Fred Allen's Jack Benny spoof, titled "The Pinch Penny Program." The performers are Danny Thomas (who sings "Take It Easy, Be Casual, Relax"), Ethel Merman, Frankie Laine ("Man Gets Awful Lonesome"), Fred Allen, Jimmy Durante ("It's Kind of Hard to Put It in Words"), Jose Ferrer, Meredith Willson and his Orchestra, Mindy Carson ("A Rainy Day Refrain"), Paul Lukas, Portland Hoffa, Russel Nype, and Tallulah Bankhead. 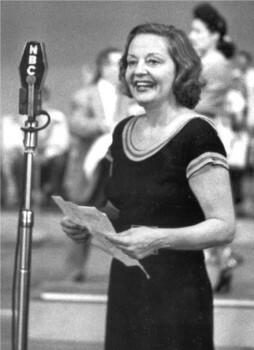 Host Tallulah Bankhead matches wits with the one, the only Groucho - who creates a fictional sponsor called "Plebo" for the broadcast. A preview of Warner Brothers' "Breakthrough" is presented, along with a performance of Dorothy Parker's "Sentiment" and an edition of "You Bet Your Life." 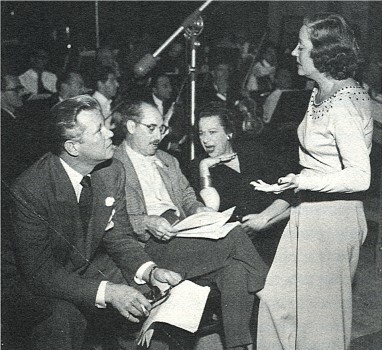 The performers are Tallulah Bankhead, Groucho Marx ("Some Enchanted Evening"), Meredith Willson and his Orchestra ("Stardust"), Frank Lovejoy, Ezio Pinza ("September Song"), Fanny Brice, Jane Powell ("It's a Most Unusual Day"), Jimmy Wallington (announcer), Hanley Stafford, David Brian, and John Agar. Host Tallulah Bankhead plays straight woman to comedians Jimmy Durante, Eddie Cantor and Bob Hope and gets a critique on her acting from Evelyn Varden in Patricia Collins' "A Matter of Perspective." Hope performs a monologue on entertaining the troops in Korea and a "Tribute to America" is presented by Jose Ferrer (who recites the Gettysburg Address) and Ray Middleton (who sings "America, Live On"). The performers are Bob Hope, Ed Herlihy (announcer), Eddie Cantor ("Josephina, Please Don't Lean-a On the Bell"), Evelyn Varden, Frank Wilson (narrator), Jimmy Durante ("What is 'The Thinker' Thinking About? "), Jose Ferrer, Meredith Willson and his Orchestra ("While We're Young"), Mindy Carson ("Looks Like a Cold, Cold Winter"), Perry Como ("Patricia"), Ray Middleton, and Tallulah Bankhead (who, after running short of time in the first two shows, finally gets to finish singing "Give My Regards to Broadway"). Host Tallulah Bankhead has a blind date with an admirer and gets comedy advice from Fred Allen (Fred and Talloo perform the classic "Breakfast Couple" skit) Jack Carson (who sings a duet with Talloo on "Baby, It's Cold Outside") and Ed Wynn. Bankhead's admirer turns out to be Ed "Archie" Gardner, who invites the cast to "Duffy's Tavern" - where Wynn analyzes the opera "Carmen," even though opera star Lauritz Melchior is singing "Pagliacci." The performers are Tallulah Bankhead, Fred Allen, Ed Wynn, Meredith Willson and his Orchestra ("Love is Such a Cheat"), Mindy Carson ("If I Were a Bell"), Lauritz Melchior ("The Prize Song"), and Ed Gardner. Host Tallulah Bankhead trades barbs with comedienne Joan Davis and welcomes Margaret Truman to the program. Fred Allen creates a radio discussion program for the President's daughter, while Douglas Fairbanks, Jr. previews his latest Columbia motion picture release "State Secret" and Phil Silvers ruminates on his career in pictures. Bing Crosby and Bob Hope are heard on one of the Chesterfield commercials. The performers are Douglas Fairbanks Jr., Ed Herlihy (announcer), Fred Allen, Joan Davis, Margaret Truman, Meredith Willson and his Orchestra ("This is It"), Mindy Carson ("The Touch of Your Lips"), Phil Silvers, Tallulah Bankhead and The Sons of the Pioneers ("Cool Water"). Oh my goodness!!! This has forever been one of my favourite radio classics and I'm very familiar with every episode from constant re-listening over the years. Some have been decent sound others pretty bad but I grew to love them despite this, "knowing" that's the best there was available. Then THIS! I almost got a lump in my throat hearing these versions which are so perfect, they sound like they've just been transcribed!!! I'm awestruck! This gives me so much hope for other great programs that I figured were never going to be upgraded sound-wise!